Provide comfort for the family of Mary Vecchitto with a meaningful gesture of sympathy. Mary C. Vecchitto, 92, loving wife of the late Anthony F. Vecchitto, died on Friday, February 8, 2019 surrounded by her loving family after a brief illness. Born in Meriden on May 2, 1926, she was the daughter of the late Alexander and Anna Skurtowicz. She resided in Meriden for most of her life and had graduated from Meriden High School. Mary was a parishioner of St. Stanislaus Church. 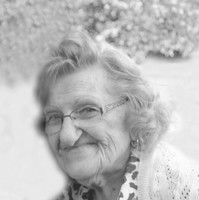 She was an active member of the Colchester Senior Center for the past seven years. She loved her cat Mitsy. She is survived by one son, Mark Vecchitto; three grandchildren, Ashley Whitcomb, Allen Vecchitto and Aja Vecchitto; five great grandchildren, Kieghley and Keagen Whitcomb, Madelyn Vecchitto, and Gunner and Gage Gookin and one sister, Ann Skurtowicz. She is also survived by many nieces and nephews. She was predeceased by two sisters, Bernice Arnold and Julia Macri and two brothers, Stanley Stowe and John Skurtowicz. The funeral will be held on Monday, February 11, 2019 at 9:15 a.m. from the John J. Ferry & Sons Funeral Home, 88 East Main Street, Meriden and at 10 a.m. at St. Faustina Parish, St. Stanislaus Church, for a Mass of Christian Burial. Burial will be in St. Stanislaus Cemetery. Family and friends may call at the funeral home on Sunday, February 10th from 1 to 4 p.m. For online condolences, please visit jferryfh.com. To plant a memorial tree in honor of Mary C. Vecchitto, please visit our Heartfelt Sympathies Store.